✅ DURABLE MATERIALS: Rustic Town vintage canvas backpack is made of canvas. Vintage style canvas backpack with adjustable and durable shoulder straps for carrying comfortably. ✅ SIZE: 20x9x13 inches with large capacity Computers Laptop Backpack with many pockets can offer more space to hold your stuffs like 15" laptop, iPad, cellphones, keys, wallets. 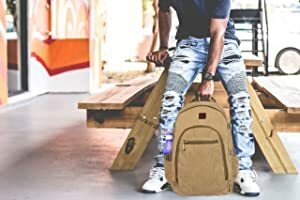 ✅ STYLE: This canvas backpack can be used as a hiking daypack, computer bag, school backpack, travel daypack, sport shoulder backpack, business laptop backpack. Weekend shopper canvas backpack. It's suitable for everyday use. ✅ SUITABLE FOR ALL OCCASIONS: High school or college bag, hiking backpack, shopping daypack, work or office rucksack etc. Made of Genuine cotton canvas with adjustable strap, The backpack feels more soft and skin-friendly. Large capacity design, most of your living necessities can be hold inside. Ideal for hiking, travel, short trip, school attendance, going out of station, vacation, camping, shopping etc. ​Your Amazon reviews are printed and framed on the walls so that we are reminded of you, the customer, every day. High-quality cotton canvas material and craftsmanship are the two elements that distinguish Life with bags from the take it easy. We ensure every piece of fabric for color brightness, softness, and regularity ac-curacies. Multiple severe excellence control tests are performed on the raw materials before they are design into bags. We only select raw materials that present no defect as candidates for bag designed. Each portion of material is repeated calculated to get consistency. Color stronghold tests are completed to make sure no color bleeding. Material resistance tests are performed to ensure toughness of real canvas laptop backpack for boys & girls, or while travel. 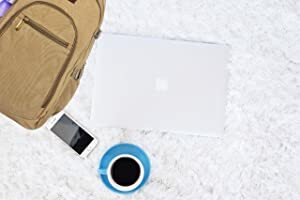 This canvas backpack large size with multi partition design with a padded pocket for laptops up to 15"
The canvas laptop backpack is designed to protect your laptop books and take it wherever you would like. It has many partitions for storage space and accessories. Padded, ergonomic and adjustable shoulder straps for enhanced mobility and comfort while travel. This Unisex Travel Canvas Backpack is stitched using high-quality threads for long time use. Its canvas laptop backpack features sturdy YKK strong zippers and a waterproof soft inner fabric lining to keep your items protected. 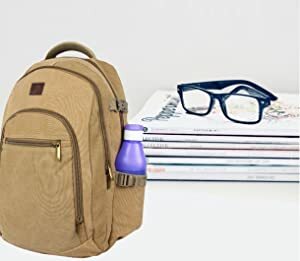 A multi-functional travel pure cotton canvas backpack for laptop carring, working, short traveling, college, school and casual use. 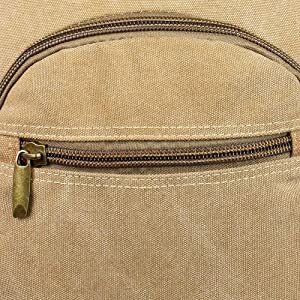 ​Easy access storage pockets are strategically placed on the exterior of this bag. Two large front fully zipper pocket and both side pockets help keep your must-have water bottles items organized and quick accessible. 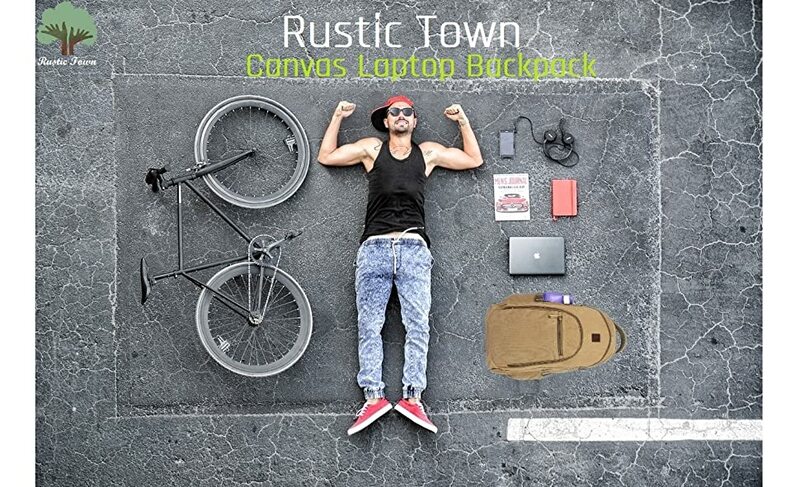 The Rustic Town Canvas laptop backpack offers generous storage capacity that features a main partition for larger items, a shockproof laptop partition that can store computers and tablets of up to 15 inches in size. The Mindle with Built-in padded sleeve for laptop 15.6 inch, and enough capacity to hold clothes, books or other stuffs. The rear partition with file slot sleeve/portfolio for parper or tablet, laptop.